Aflox-D Eye Drops has in vitro activity against a broad range of gram-positive and gram-negative aerobic and anaerobic bacteria. Aflox-D Eye Drops is bactericidal at concentrations equal to or slightly greater than inhibitory concentrations. Aflox-D Eye Drops is thought to exert a bactericidal effect on susceptible bacterial cells by inhibiting DNA gyrase, an essential bacterial enzyme, which is a critical catalyst in the duplication, transcription and repair of bacterial DNA. Cross-resistance has been observed between ofloxacin and other fluoroquinolones. There is generally no cross-resistance between ofloxacin and other classes of antibacterial agents such as beta-lactams or minoglycosides. Aflox-D Eye Drops is a highly potent and long-acting glucocorticoid. It has approximately 7 times greater anti-inflammatory potency than prednisolone, another commonly prescribed corticosteroid. 5ml & 10ml in clear poly bottles with white caps & nozzles in properly sealed. Treating and preventing eye infections associated with conjunctivitis (pink eye) and corneal ulcers caused by certain bacteria in patients 1 year of age and older. Aflox-D Eye Drops eye drops are an antibiotic. Killing the infection causing bacteria. Corticosteroids like Dexamethasone suppress the inflammatory response to a variety of agents. Since they may inhibit the body's defense mechanism against infection, a concomitant antimicrobial drug may be necessary when this inhibition is considered to be clinically significant. The combination of Dexamethasone a potent corticosteroid and Ofloxacin a broad spectrum antibacterial in a topical formulation like Aflox-D Eye Drops will together effectively resolve inflammation and infection in severe eye conditions. 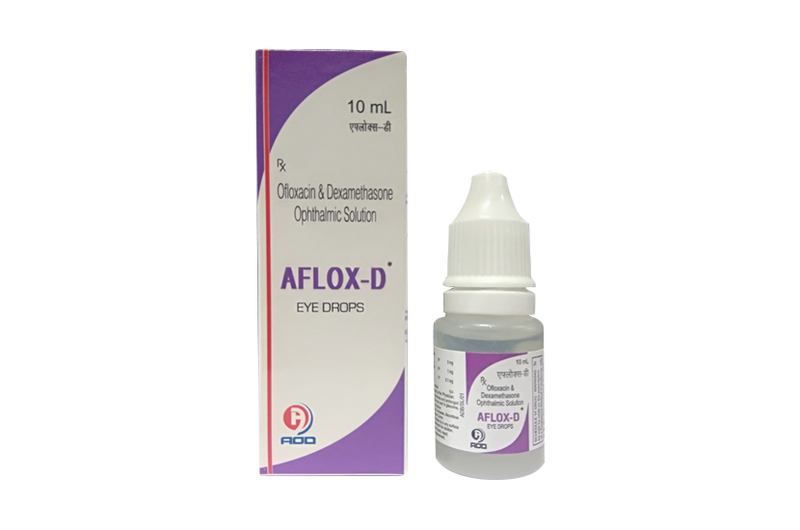 Aflox-D Eye Drops combination is indicated for steroid-responsive inflammatory ocular conditions for which a corticosteroid is indicated and where bacterial ocular infection or a risk of bacterial ocular infection exists. Ocular steroids are indicated in inflammatory conditions of the palpebral and bulbar conjunctiva, cornea and anterior segment of the globe, such as allergic conjunctivitis, acne rosacea, superficial punctate keratitis, herpes zoster keratitis, iritis, cyclitis, selected infective conjunctivitis when the inherent hazard of steroid use is accepted to obtain an advisable diminution in edema and inflammation. They are also indicated in chronic anterior uveitis and corneal injury from chemical radiation, or thermal burns, or penetration of foreign bodies. For ocular conditions: One or two drops instilled into the conjunctival sac every 4 to 6 hours. During the initial 24 to 48 hours, the dosage may be increased to one to two drops every 2 hours. Frequency should be decreased gradually or warranted by improvement in clinical signs. Care should be taken not to discontinue therapy prematurely. For optic conditions: Instill 2-4 drops 3-4 times daily. The use of Aflox-D Eye Drops is contraindicated in patients with hypersensitivity to any ingredient of the formulation. The use of Aflox-D Eye Drops is also contraindicated in epithelial herpes simplex keratitis (dendritic keratitis), vaccinia, varicella, and in other viral diseases of the conjunctiva and cornea, mycobacterial infection of the eye and fungal diseases of ocular structures. Aflox-D Eye Drops should not be injected subconjunctivally, nor should it be introduced directly into the anterior chamber of the eye. Aflox Eye Drops is supplied in 5 ml / 10ml clear poly bottles packed with printed labeled in a unit carton and, Such 25 Carton packed in a shrink sleeves.such,12 shrinks packed in a shipper.